When your baby is around 6 months old, they may need more than breast or formula milk to meet their needs. This is when the process of weaning can begin and you can start to introduce solid foods into your babies diet alongside their formula or breastmilk. Whether you choose baby-led or spoon-fed weaning or a combination of the two: weaning onto solids teaches your baby how to move food around their mouth, to chew and swallow foods. Weaning your baby off milk and onto solids can be an emotional time for many mums. We will explore the differences between baby-led and spoon-fed weaning as well as how to embark on the process and which foods to start with. When should baby led weaning start? Baby-led weaning involves your baby feeding themselves food right from the beginning of their transition from milk to solids. So rather than spoon feeding your baby mashed and puréed foods, you give your baby finger foods that they pick up and feed to themselves. With baby-led weaning your baby learns to handle lumps from the beginning and they learn to chew their food as part of the feeding process from the start. This varies from spoon-fed weaning as in this case babies learn to swallow first and chew later. With baby-led weaning you can place your baby in their high chair during your own meal time and place an array of finger foods in front of them to choose from. Anything from cooked vegetables, chunks of bread or toast, pasta or omelette can be placed in front of your baby for them to select. Choice. From the beginning of your baby’s journey into the world of food they will have the choice over what to eat, when to eat it and how to eat it. This may lead to less fussy eaters as they grow up as they are choosing their food from the beginning and experimenting with the consequential textures and flavours. Eat together. Baby-led weaning encourages your baby to eat with you and your family right from the beginning of their transition from milk to solids. After placing a selection of finger foods in front of your baby, you and the rest of your family will be able to sit and eat your meals and baby can learn from watching you all too. Texture exposure. With baby-led weaning your baby will be exposed to lumps in their mouth from the beginning. Handling lumps in their food is something spoon-fed babies can struggle with. Easier preparation. With baby-led weaning, you don’t need to invest money and time into cooking then blending or mashing the food or buying multiple sachets of puréed food. Instead, you will cook your family meal as usual and put some pieces of the food to one side for your baby to feed to themselves. Messy. Allowing your baby to choose and pick up the food can make baby-led weaning a messy option. Of course, they’re learning and mess will be part of that but it may be something to consider based on your circumstances. Lengthy mealtimes. Allowing your baby to chose, pick up, play with and hopefully eventually eat the food can make baby-led mealtimes a lengthy process. You must stay with them for this whole time because of the choking risk. Monitoring the quantity consumed. As baby-let weaning can involve playing with food and getting messy, it can be hard to accurately measure how much your baby has consumed over the course of one mealtime. This can mean your baby is relying more heavily on milk for their calories. If baby-led weaning isn’t for you and your baby, the alternative is spoon-led weaning. This involves you taking control of what your baby eats by feeding them yourself. You can blend, purée or mash up a variety of fruits and vegetables, or even your own meals sometimes, then feed those to your baby on a spoon. Alternatively, you can purchase pouches of readymade baby food to feed to your baby. With this method, your baby will be mastering the skill of swallowing before they learn to chew. When it comes to weaning a breastfed or bottle fed baby there are no major differences and the weaning process can be carried out in the same way. The main difference is that when you are weaning your baby off breastmilk and onto solids, you must ensure this is a gradual process so as to minimise the risk of mastitis which can be caused by the abrupt stopping of breastfeeding. If weaning is a gradual process, which begins with one feed being replaced by solids and then slowly building up, this will not be an issue as your milk supply will have time to adapt to the changes. The NHS guidelines state that when your baby is around 6 months old they may need more than breast milk or formula milk to meet their needs. It’s important that at the beginning of your baby’s journey into solid food it’s less about how much they eat and more about them exploring new tastes and textures. It is important to wait until 6 months to be sure that your baby’s digestive system is developed enough to be able to handle and process solid foods rather than just milk. Once you have decided whether you want to do baby-led, spoon-fed or a combination approach to weaning the next step is to pick the time of day. Select a time of day that works well for both of you: when you have plenty of time, when your baby isn’t too tired and when you won’t feel rushed. Your baby may take to weaning easily or it may be a lengthy process requiring lots of patience. Go at your baby’s pace and when they seem to have had enough then stop and try again later or the next day. Patience is key when it comes to weaning a baby. Your baby may need to try weaning several times over the course of a few weeks until they become comfortable with the varying tastes, textures and temperatures of the foods. Sitting baby in their high chair at the table while you and the rest of your family eat will help the process to seem more normal to your baby. Whichever way you’re weaning, try a variety of different tastes and textures with your baby; you may be surprised at the foods they enjoy. Vegetables are a great place to start when it comes to weaning. With so much vegetable variety, your baby can be exposed to many tastes and textures whilst getting plenty of nutrients. You could give your baby chunks of vegetables from your own meals to start with such as courgette, broccoli or cauliflower. Alternatively, puréed or well-mashed cooked vegetables, such as potato, sweet potato, butternut squash, parsnip, carrot would work well. Then moving onto fruit: pieces of banana, strawberry or mango; or puréeing apples, berries or pears. Another option is mixing baby rice or porridge with your baby’s usual milk for a more familiar flavour with a new texture. Once your baby shows signs they are ready for solid food (they are sitting up without support, developed fine-motor skills to self-feed and they’re willing to chew) then it’s time to start considering which foods to offer your little one. Naturally, this can be quite a daunting stage for parents with many unsure of where to begin when it comes to introducing their little one to solids. We have outlined 10 of the best foods for weaning with nutritional information and recipe ideas for each. Apples are a fabulous fruit to offer your little one. Apples are high in fibre meaning they’re easy to digest and an ideal food for a developing digestive system. They can be warmed or given raw. Their sweet flavour will be appealing to your baby so apples can be combined with other foods to help introduce new flavours. Why not try apple and cinnamon wedges? Begin by coring an apple and then cutting it into slim wedge slices. Heat some coconut oil in the pan and fry the apples over a low heat. Sprinkle cinnamon over the apple slices and continue to fry for 5 minutes. Apricots are packed with vitamin A and C. To avoid excessive exposure to sodium or preservatives you are advised to use fresh apricots opposed to dried ones. When selecting apricots for your little one, choose ones that are plump and orange-yellow in colour. Apricots tend to be juicy and are best eaten sooner. Keep apricots cool and once they’re ripe keep them in the fridge to maintain the fruit for longer. There are three main ways to prepare apricots for your little one: baking, steaming and blanching. For baking, halve the fruit and remove the pit, place the ‘open’ side down in a pan with 1 inch of water and bake at gas mark 5 until soft and tender. For steaming follow the same steps as baking but place in your steamer until tender. When blanching, drop whole, cleansed fruits into a pan of boiling water until fruits de soft then slice once the they cooled down. Avocados are one of the best first foods to offer your baby because of the texture and creaminess. Additionally, avocados contain ‘good’ fats and have a high nutrient content to support your baby’s brain and physical development. Slices of avocado are wonderful first foods for baby-led weaning because of the consistency. However, avocado can easily be blended with other foods to create tasty purées with a creamy consistency. Avocados are great to eat on their own with no preparation however you could try you little one with peachy avocados. Begin by peeling, pitting and cutting 3 peaches into chunks. If needed, steam peaches until tender. Peel, de seed and cut avocado into chunks. With blend or mix the avocado and peach and let baby use a spoon or fingers to feed themselves. Bananas are quite the superfood when it comes to baby’s first food: the contain potassium and fibre and are also high in vitamins B2, B6 and C. In addition to being nutritious, the soft and mushy consistency makes it an ideal first finger food but equally a versatile fruit to mash and blend with other foods. They’re a great fruit to take with you if you’re heading out with little one; their protective jackets mean they require no preparation or washing- you can simply peel and serve. As an alternative you could try frying bananas for your baby. Begin by heating coconut oil or butter in a frying pan, slice the bananas into thin sticks and add to the pan to sauté. Sprinkle with either cinnamon or ginger if desired and serve or mash and serve. Carrots are easy for babies to digest and they are packed with essential nutrients such as vitamin A, vitamin C and calcium. When it comes to preparing carrots for your little one, steaming is the best option. Ensure you peel the skin as babies can not easily digest the skin. Also, unless you have purchased organic carrots, the skin will contain high levels of chemicals so it’s best to peel and wash the vegetables before slicing and offering as raw snacks or preparing into a dish. Baking carrots can create a new taste and texture that your little one will enjoy: peel carrots and cut into thick slivers. Oil a glass casserole dish and place the carrot slivers in. Baked at gas mark 4 for 45 minutes. Finally you can purée or slice and serve as finger food. Sweet potatoes are a wholesome food to offer your little one: high in vitamin A, beta carotene and potassium. They also contain good amounts of vitamin E, calcium and folate. Sweet potatoes are packed with so many vitamins and nutrients that they are such a good food to offer your little one. The versatile consistency and sweet taste will likely make the vegetable a favourite for preparation and eating. Baking sweet potatoes is the best method of preparation: it brings out their sweet flavour whilst retaining the nutrients. Oatmeal is a wonderful first breakfast for your little one. Oats are high in fibre, calcium, protein and even some B vitamins. Steel cut oats are healthier and more nutritious than rolled, quick cook or instant oats. Steel cut oats retain the most nutrients because they are not highly processed. The best way to prepare oats is in a pan with water over a low heat. Alternatively you could use a crockpot or a rice cooker. You could also experiment with overnight oats which require minimal preparation: simply mix oats and oat milk in a container and leave overnight in the fridge. You can then add other ingredients such as mashed banana, berries and ground seeds to start to introduce new flavours to your baby. Peaches are high in vitamin A and C and fibre. Peaches are a great food to relieve constipation. Their sweet taste makes them a delicious food for your baby either on their own or mixed with other foods such as bananas, avocados and oatmeal. Peaches do tend to lose nutritional value with prolonged cooking so it’s best to eat raw or after a quick steam. If you are offering your baby peach slices with the skin then washing the fruits first will help to remove the pesticides. One easy and tasty peach snack is peachy bananas. Simply peel and pit 1 peach and steam the slices. Mash the steamed peach slices and add in half a ripe banana and combine together. You may wish to blend the two together to create a smoother consistency to suit your baby. Pears are high in fibre, vitamin C and potassium. Pears are a great fruit to offer your little one as a remedy for constipation. Additionally, they are gentle on tummies and are therefore wonderful for babies who may suffer with reflux. Pears are nutrient dense; meaning there are more nutrients per calorie than calories per nutrient. As a first food you may wish to peel the skin of the pear, however the skin is easily digestible so this isn’t necessary once babies have been exposed to a few solids. Like with most fruits, pears can be sliced and given to your baby as finger food, alternatively you could try baked pears. Halve and core pears, place them in a shallow dish with 1 inch of water. Add a dash of cinnamon or vanilla or ginger.Place the dish in the oven on gas mark 4. Bake for 25 minutes then mash and serve with oatmeal or on its own. One cup of peas contain more protein than a tablespoon of peanut butter. Peas also contain calcium, vitamin A and C and iron. Steaming or boiling the peas in a small amount of water is the best way to prepare the peas. To add more flavour to the peas you could cook them in vegetable stock. Once peas have been steamed or boiled purée them with some of the left over water. You may wish to add more water for a thinner consistency and put the mixture through a sieve to separate and of the skins that remain. You could try and add milk and butter to the mixture for a creamier consistency and even add other vegetables. If you do decide to try baby-led weaning you’ll likely be overwhelmed with information, advice, ideas and recipes from websites, social media and your mum friends. The volume of support may be handy a few months down the line but initially getting yourself a guidebook can help to focus on the facts and key information surrounding baby-led weaning. With Annabel Karmel’s book on Weaning you’ll be receiving guidance from the best selling baby and child nutrition author. Kernel gives advice on when to start, what foods to start with and how to prepare foods safely for your baby. The book also contains over 60 recipes and 4 nutritionally balanced meal planners. A highchair is always going to be needed no matter how you wean your baby. Experts advise that before you start weaning- have your baby join you round the table at mealtimes to familiarise them with process and allow them to see your enjoyment whilst eating to help create healthy and positive connotations around eating food. 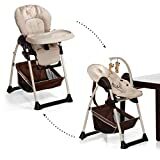 This highchair is fabulous for such a process as it has a newborn seat then changes into a highchair meaning that your little one can join you safely around the table from day 1. The new-born element is suitable from birth up to 9 kg. Its backrest can be adjusted into lying position and the play arch can be used to entertain or removed to reduce stimulation. It also has a harness to keep your little one safe while you enjoy your meal. The highchair attachment is suitable from 6 months until your baby is 15kg. It’s comfy backrest and footrest can be adjusted along with the frame to ensure optimal comfort as your child grows and develops. 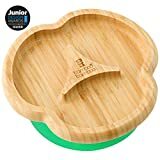 This baby-led weaning bamboo plate with suction base would be the perfect first plate for your little one. The bamboo material eliminates exposure to BPA whilst also being lightweight and stain resistant. 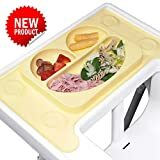 The strong suction base reduce the risk of the whole plate of food being flipped over as your baby’s muscle coordination and depth perception develop. The different sections of the plate allow you to offer your little one a variety of foods and give them the choice of what to eat and when. The suction plate can easily be released once baby has finished their meal and can be removed altogether for when your toddler is ready to progress onto their next stage. This suction plate helps to encourage independent feeding with less mess. The mats are really easy to clean and can even be put in the dishwasher which is ideal after a potentially messy dinner time! The mat contains 4 suction pads, one in each corner, which means they stick to all surfaces preventing food getting underneath the mat and onto your highchair or table. Like with bamboo plate, this mat is BPA free and contains sections to allow for a variety of foods to be presented to your little one. The mat has been designed for the popular Ikea Antilop highchair but can be used on other high chairs and surfaces. Suctions to the tray with 4 large strong suction cups. The perfect fit design means edges and rims are harder to pull by babies meaning its now even harder to throw plates to the floor. 100% LFGB EU standard and tested silicone. BPA Free. Dishwasher and Oven Safe. Baby-led weaning primarily involves using hands to explore the different textures and temperature of the food before taking it to (or at least near!) their mouths. However, the process of touching the different foods can sometimes be a barrier in baby-led weaning and that’s where this cutlery set may come in handy. If and when you feel ready to introduce cutlery to part of your little one’s feeding then the Grabease cutlery set is an excellent first choice. This set is one of the safest ways for babies and toddlers to start feeding: ergonomically designed, choke barriers and BPA free. The cutlery set is designed to give toddlers the opportunity to eat independently whilst also develop their finger strength development and helping to develop good eating habits and routines from day 1 of your weaning process. 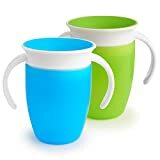 There are two main benefits of this miracle cup: firstly it reduces mess with its 360-degree drinking edge to eliminate spills completely and automatically seals when your little one stops feeding; secondly, the design supports your child’s dental development meaning it can be used as their first cup right through to when they are a toddler. The handles are easy for little hands to hold, it is easy to clean and comes in a variety of colours. A fabulous product to promote independent drinking at mealtimes. These snack bags are an excellent aid to healthy and fresh baby-led weaning outside the home. You could place veg sticks or fruit pieces into the packs or even distribute pre-made snacks such as cereal bars or crisps to limit and monitor portion control when weaning outside the house. These bags can be easily washed or placed in the dishwasher and used again the next day. They are an eco-friendly alternative to single use bags or cling film. Fun design makes healthy snacks more fun, Great for toddler snacks, nursery snacks or school snacks. More convenient than snack pots - no lids to lose! Baby-led weaning will get messy! Sometimes you may embrace and even encourage the mess… most of the time you’ll want to make life easier with a stain resistant sleeved bib. The Snazzy Kid sleeved bibs look great and are completely waterproof which can easily be wiped clean and also machine washed. 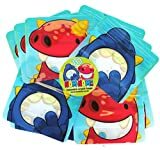 They are perfect for helping you to keep your baby clean and comfortable while they explore and enjoy their food. Unlike other bibs, these have long sleeves with elastic aged cuffs to help protect your little one’s clothes. As a little bonus, these bibs come with two milestone cards for those Instagram moments and a handy travel bag to aid baby weaning when out and about. So we’ve established baby-led weaning will get messy but you can limit the mess without limiting your baby’s experience with new foods. This may can be placed under your baby’s highchair or feeding area to catch spills and dropped food items. The material is easy to wipe clean and the mat itself can be stored away quickly and easily. The mat can be cut to a smaller size if this suits you setup better. An excellent product to help keep dinnertimes a less messy experience. Tracker- a final product that you may want to invest in your weaning journey is the Tiddler and Nipper baby weaning journal. This lovely product is a wonderful way to help you track your baby’s transition from milk to solids. The journal helps you to stay organised and in control during this huge transition as you can also track your baby’s sleeping patterns and nappy changes as well as key milestones. Compact in size, you can take this journal with you to keep your notes throughout the day. The completed journal may bring reassurance and guidance for baby number two or even be kept as a detailed memento from your baby’s early days. 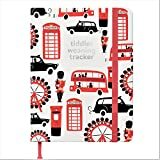 Unique daily baby weaning journal, for tracking your little one's transition from milk to solids, as well as recording daily sleeping, nappy changing and expressing patterns, plus key milestones and achievements. Use the Tiddler Weaning Tracker to identify patterns and build routine... Stay organised and in control! One of the most common fears and worries about baby led weaning we’ve heard and seen is for the baby to choke or gag on their food which create a potential medical emergency. This could potentially put a lot of parents off trying this feeding method at all so this section is dedicated to baby led weaning choking worries and steps you can take to make baby led weaning as safe as possible for a baby. A 2016 study into the choking risks of baby led weaning found that there is no greater risk of choking for a baby who is being baby led as opposed to weaned using pureed foods. If you felt that weaning your baby using mushed foods such as banana or pre pureed foods from supermarkets was going to be safer then the study doesn’t back this up. In fact, the study found that both methods did pose a choking risk (we will explain how to reduce this in a bit) as babies get to grips with this completely new world of chewing and swallowing solids. You will never be able to reduce the risk of choking to 0%. The study found that 35% of babies who took part in the study encountered at least one choking event. Although this seems like a shocking statistic, it is perfectly normal for a baby to struggle, especially at first, with being weaned. On many occasions, the parents confused gagging with choking which may be another cause of baby led weaning choking worries in the first place. Gagging is a perfectly normal and expected reaction to baby led weaning, especially at the beginning. Gagging is a perfectly normal reflex for babies to exhibit when there is too much food in the mouth for them to handle or when the food has reached too far into the back of the mouth and they are not prepared to swallow it. Gagging is the babies natural response to get rid of the food before it becomes a full-blown choking hazard. Gagging is common. As a baby’s motor skills and experience of weaning isn’t advanced they will often misjudge portion sizes and position of the food resulting in the gag reflex kicking in. Remember that gagging is perfectly normal and not a sign that the baby doesn’t want to weaned or isn’t interested in the food! Here’s a short video from BabyCentre which may explain a little better. Choking during weaning happens when the airway is blocked and natural breathing is impeded. The baby can be mildly blocked where the airway is partially blocked or fully blocked which stops oxygen entering the body and if left untreated can lead to becoming unresponsive. Although choking is a concern, it is still fairly common to happen at least once during weaning. Most choking incidents can be resolved by the baby coughing up the blockage or an adult intervening (we will cover this later). Choking is a serious thing to happen which can easily be prevented and with the right education can also be relieved if it ever does happen. To conclude the definitions, there are some clear differences between gagging and choking when it comes to baby led weaning. One is perfectly normal and the other should be a concern if it happens but steps should be made to avoid it. Like we said earlier, gagging is normal and unavoidable when it comes to baby led weaning, however the same cannot be said of choking so here are some quick and easy tips to help your baby avoid choking incidents during weaning and alleviate any fears you may have. This point should be labelled as ‘most important’. Never leave your baby unattended while they are eating their solid food. Often, you can spot problems before they happen and help them deal with frustration. Choking is also silent so if you are not keeping an eye on them you may not even notice it and lose precious time to help them out. Baby led weaning should be led by the baby and not the other way around. Let your baby feed themselves and try not to intervene or force the issue by putting food in their mouths. This is a crucial time for the baby to improve their motor functions in their arms and wrists and to understand their boundaries in terms of how much they can fit in their mouths without choking/gagging. Never put a piece of food of any kind in your babies mouth. A proper high chair keeps the baby’s posture in check which reduces the chances of choking during weaning and encourages a good eating position which will stay with them in later life. A straight back means the wind pipe is also straight which can help turn a potential chocking situation into a gag instead. The buckles help them be secure and protects them from falling out. High chairs also help keep them at the parents eye level. Take a look at our best foods for baby led weaning guide for more information, but we advise to give babies soft foods or foods which have been cooked and steamed as they are more likely to be able to chew/swallow better and should they become a choking hazard they are more likely to become dislodged themselves. Mashed foods are of course much easier to cough up and break down in the mouth. Foods that are round should be avoided as they can block the entire windpipe if swallowed hole and can be difficult for them to cough out on their own. Cherries, grapes, nuts and berries should not be given whole and should be sliced or mashed first. The length of a baby’s windpipe is roughly the width of their finger nails. Your baby’s risk of of choking and gagging are higher at the start when they aren’t very good at eating solids. Try and relax and not worry too much about choking during baby weaning and just keep at it. The better the baby gets the less likely they are to mishandle their food. In time, babies will learn their own boundaries and get a good grasp of what shapes and sizes of foods lead to choking and avoid them. Getting distracted while foods is in their mouth can lead to choking and gagging. When it’s time for some baby led weaning let that be the only activity going on at that time. Turn off the TV, put the phones upside down and don’t pick up any of their toys. If you’ve read all of our tips and you’re still worried about your baby choking during baby led weaning to the point you are unable to get past it then we’d recommend taking infant CPR classes so that you’re prepared against your worst fears. The process of weaning your baby is one which requires patience. It’s worth carefully considering whether baby-led, spoon-fed or a combination approach to weaning will work best for you and your baby before you begin the transition. Time the introduction of solid food carefully: waiting until your baby is 6 months old helps to ensure their bodies are ready for solid foods; selecting the right time of day can help weaning to have a positive start. Exposing your baby to a variety of vegetables and fruits initially can make baby weaning a fun, tasty and messy experience for you to both enjoy.